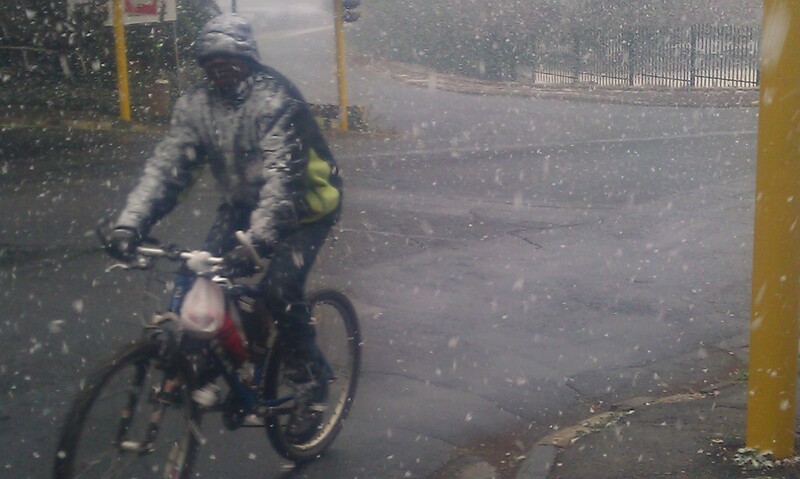 Johannesburg is an ideal city for cycling. It holds the potential to be one of the most cycling friendly cities in the world. Here are six reasons why. The weather is perfect. Summer is rarely boiling hot so a slower pace can ensure one is not drenched in sweat and moreover it is not humid. The rains in summer are very predictable falling almost on a schedule so it is easy to plan travel. Fall and spring are pleasantly mild, ideal for riding around at all paces. In winter, some gloves and additional layers of clothes will do the trick. It hardly ever snows and even when it does on the rarest of occasions, as the picture below shows, it is possible to still cycle. All of this was recognised a few years back by the City of Johannesburg. The city has a lot of very wide streets and roads some with multiple lanes which could be “dieted” to make way for dedicated cycle paths. This means that the number of lanes could be reduced without affecting vehicle flows to give over to pedestrian and cycle paths. Alternatively, lane widths especially in suburban areas can be decreased and the same time, traffic calming measures such as reduction in speed limits and speed humps introduced. In some places, roadways have huge spaces between them and the adjacent built environment. This means that developing dedicated cycle paths which are segregated from vehicles – an essential device for attracting potential cyclists – will be in some cases much easier and cheaper than expanding roadways. 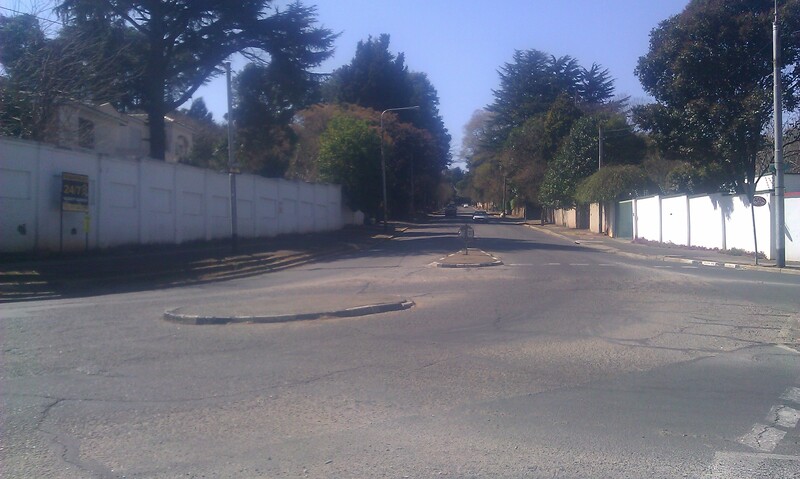 This is an option not often available to other cities around the world so Joburg is lucky. Everyone knows that Johannesburg is a sprawled City in a sprawled metropolitan region. Some think that this is a hindrance to cycling because it suggests huge distances to be travelled by the cyclist. However, if we see cycling as part of a menu of mobility options not a replacement in all cases – this dispersed spatial form makes cycling the ideal solution for connecting to the ever growing menu of public transit options instead of the private car. A commuter can leave their home by bike, park it at the nearest transport hub and pick it up on the way back or continue the journey onwards with the bicycle. So commuter cycling in Johannesburg can be the ideal public transport partner. However, we have some way to go before this vision can be properly realised. There are limited parking facilities at many transport hubs and many services (trains, buses and taxis) do not allow bicycles onto them. A majority of residents do not own a private vehicle. According to the 2003 National Household Survey, only 33% of households in Gauteng have access to cars (either through direct ownership or use of company cars). While this figure may have increased since then, a subsequent study (2007) revealed that within Johannesburg only 32.1% of households own cars. This suggests then, that the majority of people use public transport or walk to their destinations probably because they cannot afford to own a car or do not have access to one. Given that bicycles are far cheaper than cars, there is therefore a huge potential for vast proportion of the population to use bicycles for part of their journeys. There is a growing attraction to cycling. During rush hour one can easily spot a lot of commuter cyclists on their two wheels. The Critical Mass movement in Johannesburg has been growing in leaps and bounds each month. From a meagre start several years back, the last critical mass cycle ride was graced by over 500 riders including young children. Each weekend, some of the city’s riverbanks are visited by hundreds of cyclists and there is a seeming explosion of corporate and community based cycling races such as the 94.7 cycle race and Jozi Hustle. This suggests that meaningful gestures to this community of cyclists will entice them to make cycling a regular part of their daily lives. A mix of hills and flat terrain allows for cycling to provide a modest level of exercise as part of the commuting experience. Some residents might prefer this version of exercise since it is cheaper than visiting a gymnasium and is conveniently embedded in the day – it not one other thing to schedule. However if exertion is not preferred, it is perfectly possible to carve a cycling route through the City involving limited encounters with inclines. A cycling map in development by the Johannesburg Urban Cyclists Association suggests some of these routes. These are 6 good reasons I can think of as to why Johannesburg holds much potential to be a cycle friendly city. Of course there is a huge gulf between the potential and practical measures (such as dedicated cycle paths, integration with public transit and education campaigns on street sharing) that will entice the latent cyclists onto the roads. It is not an insurmountable gulf. I live in Johannesburg and I have noticed more and more cyclists, a great sign! One additional point: there are single-track dirt trails through riverside and park areas, mostly utilized by mountain bikers. These can also be used for commuting and/or for recreational biking. There is a campaign to let bikes be brought onto the Gautrain, our new train system that connects the airport to the downtown area. Where there is a will, there is a way. Keep your eye on Joburg, there is much growth in eco-progress about to happen.